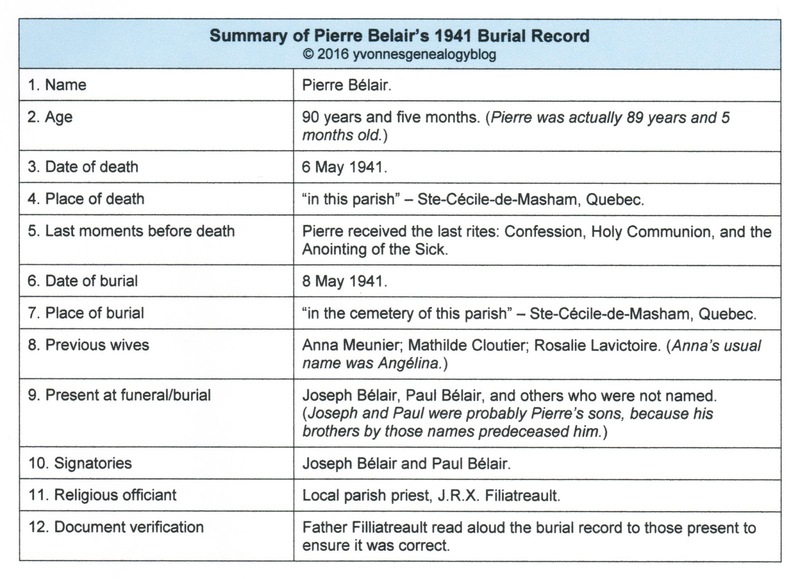 Seventy-five years ago, my paternal great-grandfather Pierre Belair died on 6 May 1941. He was 89½ years old, the father of 16 children (ten predeceased him), and outlived three wives. 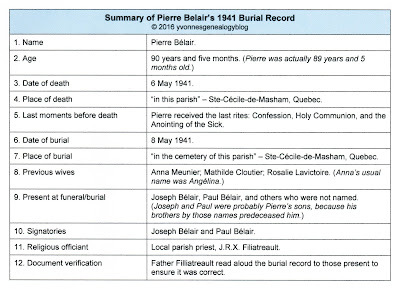 I first saw Pierre’s burial record when I visited Ste-Cécile-de-Masham (now La Pêche), Gatineau County, Quebec in the 1980s. 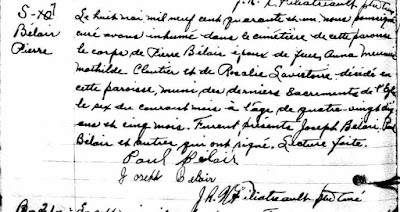 The parish church secretary allowed me to look at and photocopy family records from Ste-Cécile’s sacramental registers. Years later, I got the opportunity to re-view my great-grandfather’s burial record after I got a subscription to Ancestry.ca. The image, my transcription and my translation are from that site. Le huit mai mil neuf cent quarante et un, nous soussigné / curé avons inhumé dans le cimétière de cette paroisse / le corps de Pierre Bélair époux de feues Anna Meunier / Mathilde Cloutier et de Rosalie Lavictoire, décédé en / cette paroisse, muni des derniers Sacrements de l’Eglise / le six du courant mois à l’âge de quatre-vingt-dix / ans et cinq mois. Furent présents Joseph Bélair, Paul / Bélair et autres qui ont signé. Lecture faite. The eight May one thousand one hundred forty one, we undersigned / [parish priest] have interred in the cemetery of this parish / the body of Pierre Bélair spouse of the late Anna Meunier / Mathilde Cloutier and of Rosalie Lavictoire, died / in this parish, provided with the last Sacrements of the Church / the six of the current month at the age of ninety / years and five months. Were present Joseph Bélair, Paul / Bélair and others who signed. Reading [of this record] done. Most of my CRS posts end about here, but today I’m adding something else: a summary of what I learned about Pierre from this record. One thing I didn’t learn, though, was if my grandfather Fred, Pierre’s younger son, attended his father’s funeral. His name is not recorded as being present, but I suspect that he wasn’t there. Fred, who lived in the small village of Fauquier in northern Ontario, might not have received the sad news in time to make the journey to Masham. 1. 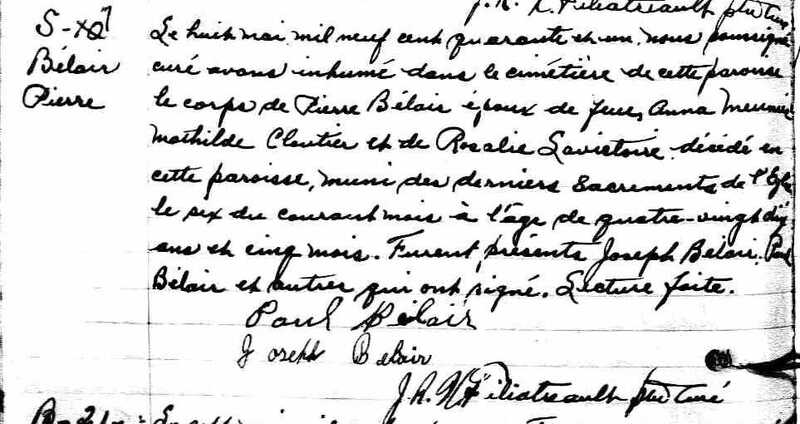 Ste-Cécile (Ste-Cécile-de-Masham, Quebec), parish register, 1930-1943, p. 326 (stamped), entry no. S.7 (1941), Pierre Bélair burial, 8 May 1941; Ste-Cécile-de-Masham parish; digital images, “Quebec Vital and Church Records (Drouin Collection), 1621-1967”, Ancestry.ca (http://www.ancestry.ca : accessed 1 March 2012).